Telecom companies have started state-wise registration needed under the goods and services tax (GST). 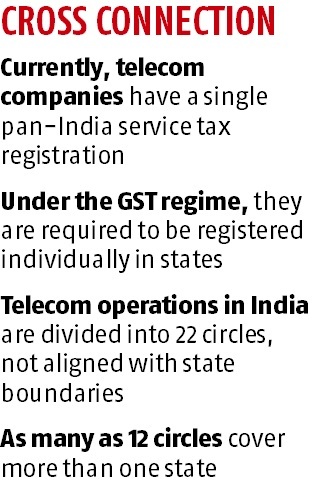 Telecom companies have a single pan-India service tax registration but the GST, which is expected to come into force on July 1, requires them to be registered individually in states. Most telecom companies have enrolled in all the states for registration. Telecom operations in India are divided into 22 circles not aligned with state boundaries. As many as 12 circles cover more than one state. The Delhi circle covers Delhi and parts of Uttar Pradesh (Noida) and Haryana (Gurgaon). “The GST is going to lead to state-wise registration and complex place of supply rules,” said Bipin Sapra, partner, tax and regulatory services, E&Y. “Compliance for telecom companies is going to increase. They will have to change their billing systems and their processes will have to be aligned with the state-wise GST requirements,” he added. There are also certain multi-circle states such as Uttar Pradesh, which covers two telecom circles, UP (West) excluding Noida and UP (East). “Business transactions for GST purposes will need to be sliced and maintained at the circle level for regulatory purposes,” said Rajan S Mathews, director-general, Cellular Operators Association of India. Telecom services are provided seamlessly across the country. A subscriber in Goa making a call to Gurugram uses telecom infrastructure in Goa, Maharashtra, Delhi and Gurugram and optical fibre cable across states. “Multiple registrations for telecom companies under the GST will increase the compliance burden and costs. A single pan-India registration under the GST will result in ease of doing business and will not have any adverse impact on state government revenues,” Mathews said. Further, clarity on contentious issues emanating from the GST laws is needed to bring in certainty and minimise the risk of litigation. The department of telecommunications (DoT) and Telecom Regulatory Authority of India (TRAI) will await the rollout of the GST before they finalise the base price for spectrum auctions proposed during 2017-18. The TRAI will over the next fortnight seek stakeholders’ comments for sale of unsold air waves and views on the 5G compliant 3,400 MHz band. The DoT recently sought the TRAI’s opinion on auctioning the remaining 1,389 MHz spectrum in this fiscal year. The TRAI will also review the base price of the 700 MHz band that was unsold during last year’s auction because telecom companies found it expensive. The 700 MHz band is considered premium for its efficiency and reach.